Erasing Shields are very numerous and many are quite common. The picture shows a group of some of the most graphic ones. Over 100 are pictured and discussed. Shields were used so secretaries could erase and correct typing errors. The earliest dated shield we have found was made in 1907 by Carter’s Ink Co. Shields were made of celluloid, plastic, metal and paper. Some had calendars on one side or ruler markings. The most valuable erasing shields are the ones that picture either typewriters or ribbon tins. 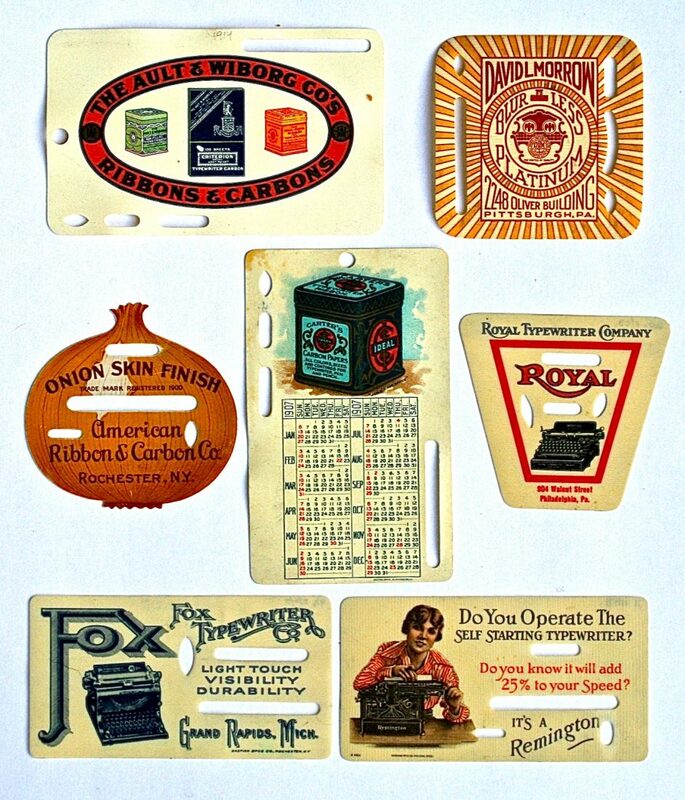 Also, considerable value is added if the shield is in an unusual or uncommon shape such as the American Ribbon & Carbon Co., Royal Typewriter Co. & David L. Morrow shields shown here.